Tina and her husband Ron have been married for 33 years and have 3 three children, all of which have been educated in the Christiansburg schools and are all graduates of Virginia Tech. Rachele is currently attending Virginia Commonwealth University Dental School. Leah is working on a second degree in Music Therapy at Radford University, and Ronnie has accepted a position in Phoenix, AZ. 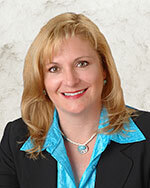 Tina has 30 years expertise and experience in sales, marketing and client services. She has a degree from the Rhode Island School of Design in Illustration and has taught art to children and adults. At Coldwell Banker Townside, she was Rookie of the Year in 2007 for her sales production and commitment to the real estate profession. When meeting Tina, her enthusiasm is evident! Uprooting a family and having to sell and/or buy a home quickly can be stressful. Having been relocated across the country multiple times, Tina understands and can be helpful by making the process as smooth and enjoyable. Tina serves on the MLS committee of the New River Valley Association of Realtors for many years. She is founder and coach of New River Diving, teaching kids springboard and platform diving. She is a Virginia Tech Swimming & Diving volunteer and VHSL certified diving official. She and her family are members of the St. Jude Catholic Church. Tina and Ron serve on the Financial and Fund Raising committees of the church.